In the first part of the article “Money management on cryptocurrency market“, we discussed in details the investment part of your cryptocurrency trading portfolio, how it is formed and adjusted. But crypto investments cannot be called the most exciting part of the whole trading process. Investments are very effective and profitable, but they still do not carry exactly those emotions that you can get in the process of live trading, right at the spot. If you want to plunge into the world of trading and experience all those feelings while watching the price go in the direction or vice versa, breaking all your predictions into the opposite, then in this part of the article we will look at the most interesting for you – the speculative part of your trading portfolio. Recall the basic distribution over the entire portfolio: 60% is an investment (cold) wallet and 40% is a speculative (hot) wallet. For simplicity and clarity of calculations, we take the value of our speculative part of the portfolio equal to $1000. The first rule – never trade with the full amount of your investment funds. Losses from cryptocurrency trading with $1000 will be much greater than, for example, from $100. The recommended load on a deposit in a single transaction is a maximum of 20% or $200 in our example. Thus, when trading at maximum values, you have the opportunity to open 5 transactions at once, which is also not worth doing. 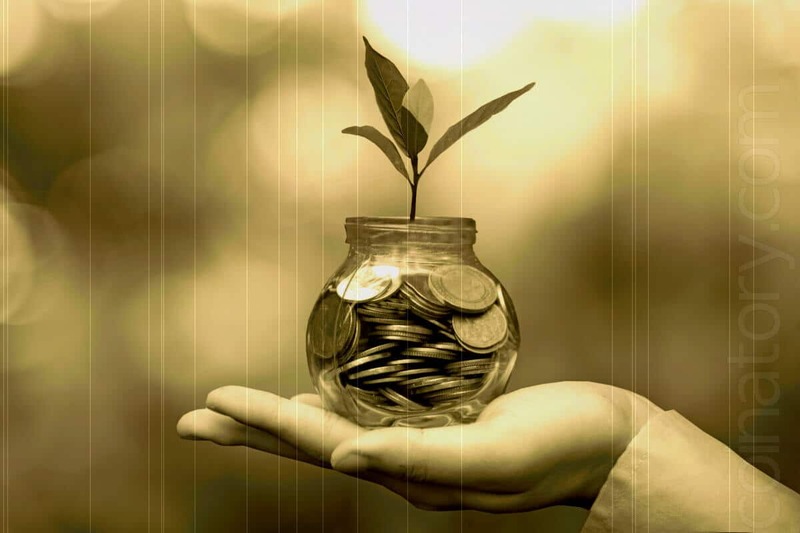 You should always have available funds on a speculative account, at least in order to additionally buy some instrument in the event of its long-term growth or fall in your direction. Thus, it is recommended to have no more than three simultaneously open positions, and leave everything else reserved. The second rule is the size of your risk, i.e. those losses that you are willing to incur, and which will not undermine your speculative account, should not exceed 10%. If you went to a negative profit that exceeds this limit, it means that something is wrong with your strategy, you are acting in a wrong way and you don’t understand something. The only right decision in this situation would be to close all open transactions, if any, and to do a thorough analysis of their failures. The strategy that leads you to such a negative profit is vital to revise and rebuild because such a strategy is fundamentally wrong. Read manuals, ask for advice from other, more successful market participants, sort out the problem, test your redesigned strategy, and only then return to trading, while not forgetting to replenish your speculative account with the amount you lost. For our example, we will set the maximum percentage of losses equal to 5%, or $50. This means that all the deals that we will open, and the limit we have is three, being unprofitable, should fit into this limit. Setting up the Stop Loss (SL) will allow us to control losses. Further, it all depends on your strategy, in which clear rules should be formed where your SL is set. If your SL strategy should be set at a distance equal to the entire defined risk of 5%, then, in this case, your limit on the number of simultaneously open trades is reduced from three to one. It is very important and you can never neglect this rule. Short SLs are much more likely to work than long ones, but losing for example 2% of the maximum amount of the transaction, which is only $4, and then finding a more profitable entry point that quickly blocks your loss is much more comfortable and safer than sitting and watching the price go fast in your direction, getting closer and closer getting to your long SL. Also, short SLs protect not only your deposit but also your emotional and mental health. So having made one losing trade for a maximum percentage of losses, you have to leave the market, frustrated, depressed and in a bad mood. By setting short SLs, you have both time and opportunity to cover your losses and close the trading day as a plus. For example, setting SL at 2% you will need to complete as many as 12 losing trades in a row to select an acceptable percentage of losses. It is very difficult to get 12 SLs in a row, even in terms of simple statistics. Ignoring the SL setup is completely unacceptable. Because you can sit for three, five, eight months with your losing trade and not all traders can withstand such a drawdown. It is very hard both for a deposit and for the emotional component of your trading. Surviving a loss of $4 is easy. Dealing with the loss of $800 is much more difficult. And it becomes psychologically impossible to cope with the fear of the following failures and losses, in general. Do not bring yourself to this state. The third rule – when you reach the loss limit, you leave the cryptocurrency market. There’s no need to wait until you make the maximum acceptable amount of lost trades. If you see that one by one you make a deal with a negative profit, if you are nervous and from the accumulated amount of losses, if you have a desire to recover losses quickly and as quickly as possible, if you feel emotionally and psychologically uncomfortable and feel stress, leave with the market until it’s too late. Take a break until the end of the day or even a few days. Do something else, go to the cinema, take a trip to the neighbouring town, anything will suit you, the main thing is to distract and calm down. Haste, nervousness, the influence of emotions, thoughtlessness of actions, impulsive decision-making, all this should be left behind during speculative trading. If you cannot cope with your own emotions, how will you cope with a huge, impulsive, unpredictable and chaotic cryptocurrency market? No way you can do it. In the end, you lose. If your trading system gives you permanent losing trades, do not expect that it will suddenly work by some miracle. Do not try to increase the number of deals hoping that “this, last one” will surely be profitable and will cover all losses. If you are already losing, do not wait for the maximum percentage of your losses, and, even more, do not go to negative below this limit. Look for new ideas, read books, share experiences, seek advice and recommendations, rebuild your strategy, analyze your losses and try again. This rule applies not only to beginners who find it most difficult to cope with emotions and first losses. Those market participants who have long been engaged in speculative trading are also inclined to make this mistake. Already having a strategy that makes a profit, having a fully formed portfolio, where the investment part itself covers losses from failures with the speculative part, people still get nervous and want more, break, jump from tool to tool, close profitable but not fast deals, unreasonably open them on other coins that suddenly began to grow, etc. Do not do this. If you have a working system that brings you profit, you do not need to “improve” it with dubious innovations, it also works. Not broken means does not need to be repaired. The fourth and most important rule of speculative trading – the presence of the financial plan. Your trading plan must be drawn up and written down before you complete your first trade deal. Make a table, draw a diagram, write down the list of the items, whatever you want and how you prefer, but the trading plan should always be. Option “I have everything in my mind, I already know everything and remember why I need this writings?” is unacceptable. You’d better immediately transfer all the funds allocated to trade for charity: you will lose them anyway, so at least you will help to those in need and save your moral health. 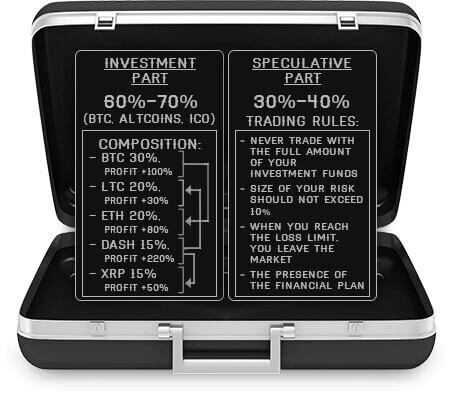 Your financial plan should consist of trading and investment plans, and should contain absolutely everything: the total amount of funds you have, how much money you put in the investment part of the portfolio, how much you put on your speculative account, what percentage ratio between instruments in your investment portfolio, how much it is in fiat, how the profit from the investment will be distributed, what percentage of losses is permissible when trading, what time you will trade for an hour, how far you will set the SL, how many trades are to be made and everything that you think should matter. You must write everything clearly and point by point so that you do not miss anything, even the hours and minutes of all your actions. In addition, you should have exactly the same trading strategy described in paragraphs, from the described points of which you cannot retreat by a single step. You should always have all this in front of your eyes and you should analyze each of your actions on the market for each item of your entire financial plan and trading strategy in order to get the exact answer to the question whether your intended action fits into your financial plan or not. If the answer is “no”, then it is better not to perform such an action, no matter how profitable and promising it would seem. It’s better you will not receive profit, than you lose the deposit. In conclusion, I would like to summarize a little. There is no easy money anywhere; there is no easy money in trading either. If you are not ready to work, study and spend your time, better don’t start. Remember that trading in the cryptocurrency market, like in other financial markets, is a job and the percentage of those who really know how to do this job is very small. Remember, most market participants lose their money and this happens not because they are stupid or inexperienced, but because from the very beginning they did not want to take this job seriously. They read something somewhere, watched a video on YouTube and think that they will break into the industry and become millionaires. Do not be a child who has just assembled a model of an aeroplane with the LEGO constructor and thinks that he can now sit at the helm of the Boeing right now and make a transatlantic flight. Trading and investing in the cryptocurrency market can make you a wealthy and financially independent person, but for this, you have to dispel all your pink and caramel-vanilla illusions first and begin to work hard. Success will not come right away, it may take months or even years. But if you set a goal for yourself and want to learn how to make money in the market, take it seriously, achieve this goal correctly and consistently, and perhaps then you will become the owner of one of the most popular, profitable and mysterious professions in our world.